During the course of the New Swedish Cyprus Expedition (NSCE) in spring 2010 a ground- penetrating radar survey (GPR) was carried out at Hala Sultan Tekke in Area 6, leading to the discovery of a large Late Cypriote complex. The compound is bordered to the north by a substantial wall, against which nine rooms (so far) could be exposed. Two occupational phases have been verified but there are indications of a third. The suggested functions of the various structures of the most recent phase are as living, working, storage and administration spaces. The rich find contexts point to the production of textiles and metal objects, and the locally produced pottery is generally of high quality. There are also many imports, mainly from the Mycenaean sphere of culture. The locally produced vessels from Phase 2 include the “Creature Krater” which is a masterpiece of high artistic standard. Another piece of elevated artistry is the part of a “Warrior Vase”. After the untimely death of the author’s former teacher and friend Professor em. Paul Åström in October 2008 the Swedish excavations were resumed at the Late Cypriote city of Dromolaxia Vizatzia/Hala Sultan Tekke under the direction of the author from Gothenburg University, Sweden, with eductional and scientific cooperation by the University of Vienna, Austria. Surveys and excavations were carried out in Area 6 from 7 May to 5 June 2010. The team consisted in addition to the director of the excavations, P.M. Fischer, assistant field director R. Feldbacher, technical archaeologist H. Ta’ani, and architect M. Bataineh, of 13 archaeologists and students, most of them from Sweden, others were from Austria, Denmark, Germany and Jordan: W. Försth, L. Franz, J. Gimmerstam, C. Hagberg, Fa. Kärfve, Fr. Kärfve, P. Klingborg, S. Macherides, M. Persson, I. Sulzenbacher, O. Svensson and N. Werther. A. Fischer participated part-time. Limited trial excavations were carried out in the northern part of Area 6 in 1972 by E. Åström and A. Hatziantoniou. The results from these soundings point to a settlement from Middle Cypriote III (?) to Late Cypriote I but also from Late Cypriote IIC to IIIA and later. Amongst the earliest wares excavated then in Area 6 are White Painted Pendant Line Style, Proto White Slip, Monochrome, Bichrome Wheel-made, White Painted V-VI, Red-on-Red and Red-on-Black. Later wares included Late Helladic IIIA2 and Plain White Wheel-made II. Air photography of Hala Sultan Tekke. Determination of the complete occupational sequence of the site, including investigation of pre-12th century levels, is the main task of the planned project. The intercultural synchronisation guided by Cypriote ceramic key wares and the study of radiocarbon dates from essential contexts from the current excavations are also amongst the main undertakings of the present project. Magnetic and electrical prospecting have been carried out over the years at the site. In 1980 the first ever GPR survey conducted in the Eastern Mediterranean was carried out by the present field director at Hala Sultan Tekke. In May 2010 a high-resolution GPR survey was carried out within Area 6 in order to facilitate the selection of the spot for the excavation. Over the course of three days Area 6, measuring 2356 square metres, was scanned by I. Trinks (then from the Swedish National Heritage Board) with the assistance of P. Georgiou. For this georadar survey a state-of-the-art digital 500 MHz antenna system was used. The overall length of the 371 measured GPR profiles amounts to 18855 m. A series of GPR depth slices, viz. horizontal data images corresponding to 10cm. depth intervals from the surface down to 200 cm depth, were generated. Structures indicating architectural remains started to appear in the GPR images at a depth of approximately 30 cm below the surface and were visible down to at least 100 cm. The most clearly expressed anomalies were concentrated in the south-western part of Area 6. There are, however, further rectangular structures, although not as distinct, in the central and eastern parts of Area 6. 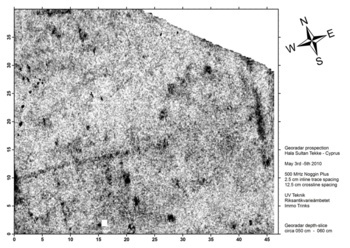 In the eastern half of the survey area a possible circular anomaly with a diameter of approximately 20 m can be seen in the data at a depth of 40 cm below surface. As a result of the GPR survey it was decided to open a 10 m ´ 10 m square, later extended (T1A-D; T3A represents a later extension) in the south-western corner of Area 6, where the radar images had indicated fairly detailed, stone-built architecture. Another (test) trench was opened in the east (T2). The structures detected by GPR and subsequently excavated consist of a compound at least 25 m long, bordered to the north by a wall running roughly east-west , against which a number of rooms were built towards the south. Using the GPR data we were able to discern fascinating details such as openings in the walls and circular stone structures within the compound, all of which were verified within narrow margins during the course of the excavations. Radar image (depth 50-60 cm). In order to provide accurate maps based on precise measurements a GPS survey was carried out with the kind assistance of the Department of Public Works/Sea Works, Nicosia. A number of fix-points were measured with mm accuracy and with reference to heights above mean sea level (MSL). 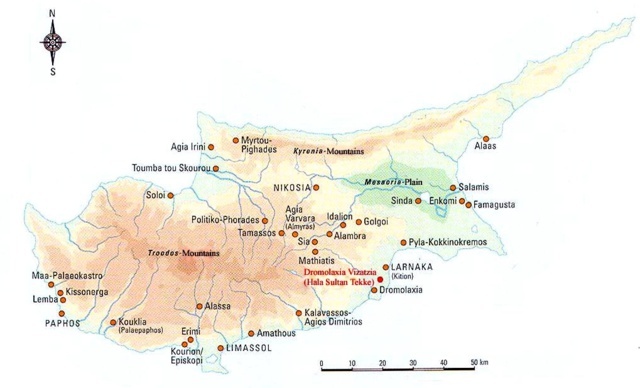 The coordinates of the fix-points refer to the Cypriote Local Transverse Mercator (LTM) projection system, which has the same Central Meridian (33º E) as the zone 36 of the Universal Transverse Mercator System (UTM). 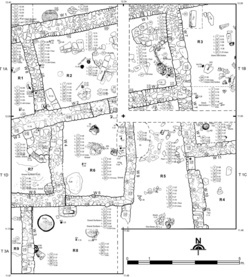 Consequently the previously published maps of the excavated settlement and tombs (see HST1-12) have to be corrected since measurement errors could be demonstrated. A total station (electronic distance measuring device) and database were used for the recording of all structures and small finds. The photographic documentation included several digital cameras and a video recorder. With the excellent cooperation of the personnel of the local police helicopter division numerous still pictures and videos were taken during the excavations. The excavations were continuously supported by an electro-magnetic detector and an industrial vacuum cleaner powered by apetrol-driven generator. In principle, most of the excavated debris was dry-sieved. The thickness of the colluvial soil varies between 0.05m. and 0.15m., the average being approximately 0.1m. The general impression of the structure of the colluvial soil is that the area did not suffer from post-Late Cypriote human disturbances or animal holes. This stratum contains the bulk of findings from this year’s excavations. The thickness of the stratum is up to 0.8 m. It comprises roof constructions, mudbrick superstructures, stone-built wall foundations and several floors indicating sub-phases. In addition to the rich find assemblage it also produced architectural elements of limestone, once parts of door/roof constructions and water/drainage systems, and ashlar masonry. All architectural remains are orientated roughly north-south/east-west with a slight deviation of the longitudinal axis towards the west in the northern and eastern part of T1. The architectural remains are dominated by a stone wall running east-west, 0.8 m wide, and preserved to a height of approximately 0.7 m (W1). This wall corresponds to the wall at least 25 m long running from the western fence towards the east as indicated by GPR. Nine walled spaces (Rooms R1-9) to the south are separated from each other by division walls 0.4 – 0.7 m wide. Helicopter photography of Phases 1 and 2. There is a sherd which depicts the lower part of a warrior in an aggressive pose holding a spear (? ), obviously from a warrior vase. Three colours were used: red for the body and the weapon (? ), black for the undergarment and white for the skirt and the shin guard. 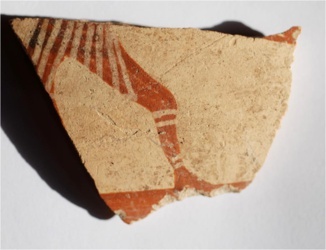 The perfectly painted leg recalls representations on Aegean frescos and the white overpaint might be influenced or have its roots in the Minoan sphere of culture. The fabric is not typical Mycenaean, and – although slightly burnished – it lacks the lustrous appearance of typical Mycenaean ware. Amongst other the finds are many loom weights, spindle whorls, bronze rings, bronze spearheads, a number of complete ceramic vessels and an ostrakon from the rim and neck of a pithos with Cypro-Minoan signs, which were incised post-firing. The complete bronze head of a bull used as a weight should be mentioned. 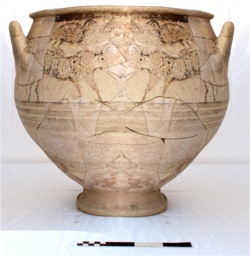 Amongst the complete or nearly complete vessels is a Canaanite jar, a chalice belonging to the White Painted Wheel-made group of wares and a krater of Plain White Wheel-made ware. Other finds of importance are numerous olive stones, pieces of copper slag, a large, irregular, piece of melted lead, two bronze fishing hooks, a complete, leaf-shaped, bronze arrowhead, a pestle of basalt, a millstone of limestone, a grooved bead of faience and a fairly complete krater of Plain White Wheel-made Ware. It is our preliminary impression that Stratum 1 was destroyed during an military assault, however, substantial ash layers are not present. This stratum is so far only visible in the western portion of T3A close to the southern and western fence. Two finds should be mentioned: one is an excellently finished button of bone with geometric incisions in a flower pattern, and the other represents one of the highlights of the 2010 season, namely, a large krater which received the working name “Creature Krater” in acknowledgment of the dominating, skilfully painted motifs (height 42 cm, max. diameter 49 cm). Stones appear on the very last day of the excavations east of W13 and may belong to an even earlier phase of occupation. A test trench (T2) was opened in the eastern part of Area 6 near the eastern fence, where the GPR survey indicated a structure 1-2 m wide running roughly north-south. A circular stone-built structure was found ca. 0.3 m from the surface. It has a diameter of 1 m at the top, is 0.4 m deep and becomes narrower downwards. In addition to a number of Late Cypriote sherds two finds are of special interest: one is a toggle pin of bronze and the other a complete exquisite bull’s head of bronze, which lay on the limestone block in the bottom of the structure. The function of the bull’s head is most likely that of a weight. The structure is interpreted as a grain silo or a container for other foodstuffs. Lead sling bullet, and bronze objects including a bull’s head (weight) after conservation by the Department of Antiquities. 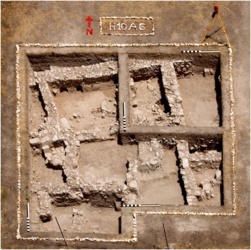 A large Late Cypriote complex has been discovered in the southern part of Area 6 whereno substantial structures were found during test soundings in the 1970s. The use of various surveying and recording techniques turned out to be of great assistance. The GPR survey, for instance, suggested a compound a minimum of 25m in length of which only minor parts in the south-easternmost part of Area 6 were partly exposed during the 2010 season. 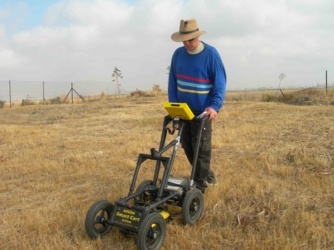 The subsequent excavations verified the GPR results to a high degree. The major part ofthe compound lies outside the present fence to the west and south. There are at least two phases of occupation represented of which only the most recent, Stratum 1, could be exposed during this season. The compound is bordered to the north by a more substantial wall against which a number of rooms/spaces were built, nine of which were partly exposed during this year. The suggested functions of the various structures are those of living, working, storage and administration spaces. Numerous loom weights and spindle whorls of fired clay and stone point to the production of textiles, and copper slag and lead to the production of metal objects. 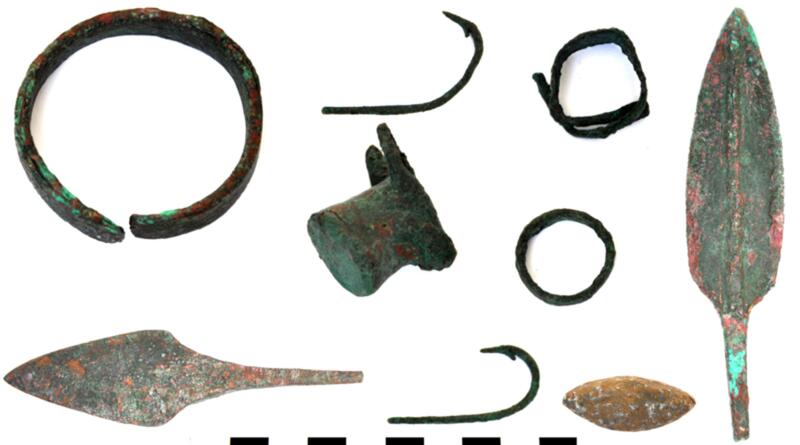 There is an abundance of finds which include jewellery, tools and weapons of bronze, amongst which are a bull’s head, finger rings, bracelets, toggle pins and fishing hooks. Other objects are of stone and bone, the latter including a nicely decorated button. 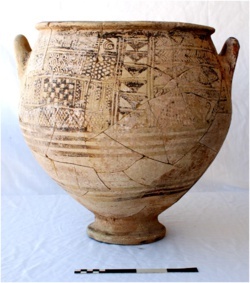 In general, the locally produced pottery is of high quality and so are the imports mainly from the Mycenaean sphere of culture. Stratum 1 was probably destroyed during an military assault, however, substantial ash layers are absent. The Creature Krater, which belongs to Stratum 2, is a masterpiece of high artistic standard. 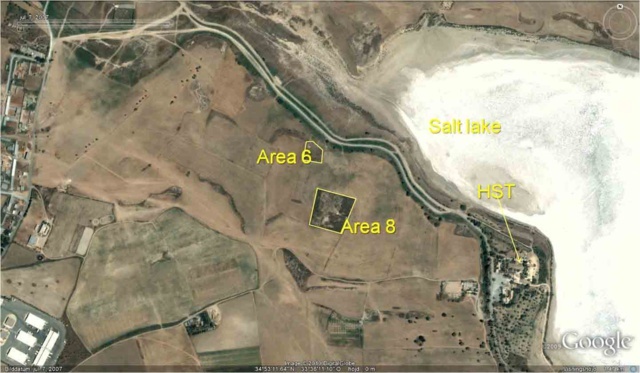 In order to expose additional portions of this most interesting compound Area 6 will be extended to the west and south. Thanks to the kind and proficient support of the director of the Department of Antiquities, Dr M. Hadjicosti, and the then acting director of the Department of Antiquities, Dr M. Solomidou-Ieronymidou, the mission could be planned and accomplished efficiently. Further support was given by the head of the Larnaca archaeological museum, Mr P. Kyriakou, archaeological officer Dr G. Georgiou from the DAC in Nicosia, Mr P. Georgiou (and his family), former employee of the DAC, and H.E. ambassador I. Lindahl of Sweden and F. Olson, the first secretary of the Swedish embassy in Nicosia. Much appreciated funding was received at short notice from the Swedish Söderberg Foundations very kindly supported by Dr T. Söderberg, Gothenburg. The GPR survey was professionally carried out by Dr I. Trinks from the Swedish National Heritage Board and financially supported by the Royal Academy of Letters, History and Antiquities, Stockholm, Sweden. Additional support was provided by Prof. K. Kristiansen and Prof. G. Malmstedt, the prefect of the Department of Historical Studies, both Gothenburg University, and the Åström family. Further support was received from the board of the association of the Friends of the Swedish Cyprus Expedition. The Police Aviation Unit, kindly supported by Mr Andreas Ioannou, provided excellent air photographs during and after the excavations.